I have been asked a few times of any helpful books I have used along the way, I thought it was about time I put together my version of my most helpful resources. Here are my number one suggestions to start designing/building. This will give you an overview of all the decisions along the way and has suggestions to get started designing! There are four parts, they aren’t dependent on each other, you can just get the ones that matter for you, ‘Construction‘ options, ‘Systems and Utilities‘, ‘Codes and Foundation Selection‘ and finally ‘Design‘ or get all four HERE. More detailed info HERE. Tiny House Scaled Component Cut outs – This is a basic set of simple (hand drawn, nothing fancy!) 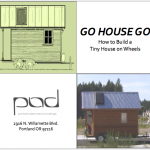 scaled cut outs of the most common tiny house components. You can save yourself some time, download, print and cut out your own needs and arrange and rearrange them in a way that works for you. There are blank sheets for custom objects. Available HERE, more info HERE. Ethan Waldman wrote a great book called Tiny House Decisions, it goes over all of the big questions you need to ask yourself, systems and personal experiences, it’s well researched and should help you figure out what you want to do and also WHY! Dan Loche has a great book called Tiny House Design and Construction Guide, packed full of great information! Andrew and Gabriella put out a set of four ‘How-To’ DVDs which is phenomenal! TONS of great info over all aspects of tiny in those! 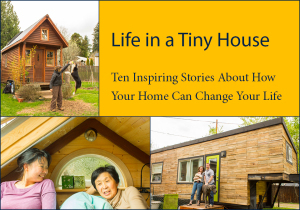 Drew Odom put out an e-book from tiny r(e)volutions on how to decorate a tiny house. I have had the chance to look through it, it goes over a lot of great ideas and is nicely priced for the info contained. It has a lot to do with storage types of ideas, psychological effects of various design components etc. It’s quick and concise. You can see download that HERE, definitely worth the money. 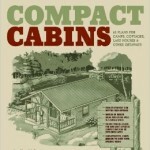 There is another book called Compact Cabins: Simple Living in 1000 sf or less, this one is great for looking at various floor plans, sometimes it’s hard to make sense of the space for me in 2D like that but it’s got a TON of plans. It is not graphically ‘magical’ but there are some cool concepts to think about, unfortunately mostly in plan, not as much in elevation, still, is a good resource. 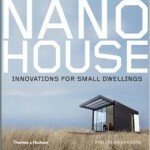 Books like NanoHouse are great to flip through and pull ideas from. Not as much for reading but looking through for ideas at all the pictures. I personally get a lot of ideas that way. That one is more ‘modern’ in style, but there are others. I am assuming you may gravitate that direction though if you like my house . Some other great flip through books I have got enough out of to purchase are Small Eco Houses, Off The Grid Homes, and The Big Book of Small House Design. 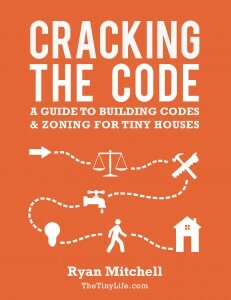 For questions about any code issues (which may seem overwhelming in and of itself) Ryan at thetinylife.com put out a great little ebook called Cracking the Code. There just always seem to be questions from others and that book clarifies the main issues so you can at least talk back to those critics without letting them overwhelm you with doubts like critics tend to try to do . It’s not so much about ‘design’ in the traditional aesthetics sense but great info that is highly recommended. For actual construction details on specifically attaching to a trailer Go House Go is highly recommended (I found this very helpful even if very technical, and not so much about the ‘design’ side as much as the necessary side of things). Depending on your area there are a lot of good moisture protection details in there too. 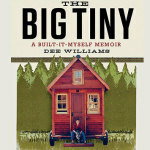 Dee Williams put it out and she lives in the rainy Pacific northwest, that may or may not be helpful but it’s great info to know about at least. For electrical and plumbing: First! 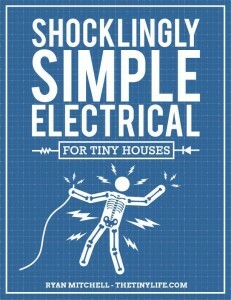 Ryan came out with a great E-Book specifically for tiny house electrical called Shockingly Simple Electrical for Tiny Houses, I wish it was out when I was building, it’s a GREAT resource and as always very well done! Back in my day before that was available ;), I went down to home depot and snagged some basic wiring and plumbing books. 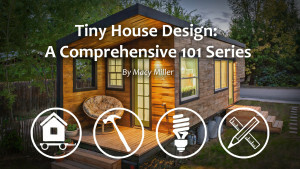 I liked the Black & Decker ones (Plumbing, Electrical) but I’m sure any of them are great, it’s really pretty basic information that you need to know and fortunately tiny houses aren’t usually big enough to get too complex if you don’t want them to! Ryan’s book is great because it weeds through all that others stuff you don’t really need to know for you! I suppose a good framing book would be good too but some of that is in the Go House Go book too so I would start there and then look further for any other info on king-studs/top plates etc. that you’d like to know. The internet has some great basic guides on that too. Again, nothing will be too complex on a tiny house, they tend to be WAY over engineered because of their small spans anyway. A simple diagram like the one quickly Googled below can cover a lot of the basics about typical wood construction, if you’re interested in SIPs panels, metal studs or another more unique situation it is definitely worth looking that up and/or reaching out to another tiny house builder who has taken a similar path, referring back to the first link HERE. Another resource I will officially ‘plug’ is the Tiny House Magazine that Kent Griswold has been putting out. They have been running some great articles in there, I have even got to help write a couple! . How to make your house your home etc. Lots of pretty pictures and ‘How-Tos’. I’m not sure if he’s running any now but he runs specials sometimes. I hear a lot of great feedback from those magazines. Hopefully those resources cover most of the big issues, I will certainly add to it over time, please let me know if you’re looking for some other resources, I am happy to suggest any leads I have followed. I initially started with a free WordPress.com site but as the space filled up I have had to transfer to paid hosting. read read read. did i mention reading? get to where that when you see something in a home you will know what it is, what it does and why you do or do not need it. buy quality books. you will need them when you build. to refresh your memory and to show helpers what YOU want not what they have on their mind. you don’t want them to hurt themselves. joke. by the way homes are for people. houses are for chickens, hogs or ? you can have your dream. you can make mock ups with kids chalk on the street or abandoned parking lots. use your imagination. i would avoid your garage. hard to make adjustments. cardboard cutouts are better for me if you can find the cardboard. another thing is that in construction a lot of stuff has a “nominal” measurement. that means they don’t know. just close. almost always appliance or unit will be “slightly” larger. i’m laughing, what can you do? i have been on a lot of jobs to get appliances but usually showers and/or plumbing drains installed, then i was gone. pays well, very well. different is neat. very neat. one rule i have is that everything has to be on site. appliances, cabs, stool, counters tops and onward. lumber and whatnot is available. if you are building on cash flow at lest go and measure stuff. i want to be able to finish the job now. what you do may very. i am a 69 year old master plumber, licensed electrician and drain cleaner. dc is where the real money is at. no license required here. please don’t pick on my grammar. i was a double math major with a physics major. i did pass english, really. i do use spell check. macy. so you are an architect? do you sell stamped plans. that would help with code appeals i would think. i will re-frame any stories and/or jokes. be a good one. I’m curious….those who are looking to put their tiny house on private land owned by someone else, what do you require? As far as electricity and water – is everyone off the grid? no, rarely are others off grid though it happens, requirements vary by house, I personally require a potable water hose (I have, so really a hose connection) and a 15 amp electrical cord plugin. Some require more, some require less, could be septic hook up if you choose a flush toilet, could be totally off grid, it is unique to each home and something to plan for in design as a tiny home owner, having easily accessible options will open up parking opportunities, having a pretty extensive septic/electrical will lower opportunities.